As a business owner do you need to rethink your business? How have you faced the challenge of leading your firm to create 21st Century sustainable profitable growth? Do you take the time to give yourself the opportunity to understand, unlearn and reflect your business so you can look forward with fresh eyes? Personally, do you need to work on your ability to think strategically? Are you ready to provide clear direction to your leadership team on how they must embrace change and adapt to a new business world? By working one-on-one with Andy, you will build a clear vision and understanding of what you need to do to take your company forward. You will grow your own confidence in facing and diagnosing and facing the next 5 years despite how risky and daunting it is? 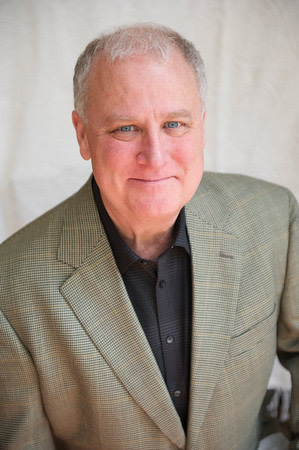 He will prepare you to implement needed changes and lead your team through transitioning your company for the future. Are you most comfortable learning in a private one-to-one relationship, either in person or over email, Skype and phone calls? Andy’s direct yet supportive coaching will empower your business optimism and reenergize your business purpose. Reach out to Andy and discuss how his approach to coaching may be just what you need. 252 pages, 6 x 9, Paper. 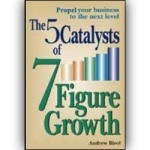 Of the more than 1,000 business owners he interviewed over the last 25 years, every one of them asked Andrew Birol the same question: “My business is not like any of the ones you’ve worked with. 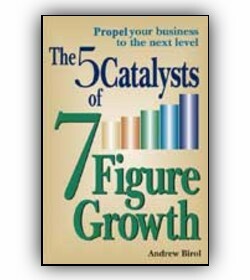 How can I grow it to the next level?” The 5 Catalysts of 7 Figure Growth provides the answers. Only $15.99. Click HERE to order your copy now.